Smartphone Airstrike: Need to call in an airstrike? There’s an app for that. Need to kill bad guys? Just smartphone it in. | DefenseReview.com (DR): An online tactical technology and military defense technology magazine with particular focus on the latest and greatest tactical firearms news (tactical gun news), tactical gear news and tactical shooting news. One of the reasons why it’s so dangerous to mess with the United States militarily is that, while we Americans value hard work–which makes us formidable, in itself,–we’ve always exhibited and enjoyed a very healthy combination of inherent creativity/inventiveness and laziness, in the sense that if there’s a way to make our lives both easier and more productive at the same time (getting more work done with less effort) by building a better mousetrap, then, by God, we’re gonna’ figure it out and do it. Hell, we pride ourselves on it. Many American inventions now exist for precisely this reason. Some immediate examples are the telephone, the incandescant light bulb, the microwave oven, the drive-thru window, and the atomic bomb. So, when it comes to war, if there’s a way to find and kill you with the press of a button or the click of a mouse, we’ll figure it out, sooner or later, and you WILL DIE. You can run, but you’re just gonna’ die tired. The aforementioned atomic bomb is the ultimate easy/mass-kill military weapon ever invented, and it was invented right here in the good ol’ USA. It took only two of those bad boys being dropped on Japan to make the Bushido-loving Japanese military immediately surrender unconditionally–not an easy thing to do–end World War II, and keep us from having to invade their country, saving at least hundreds of thousands of American lives. Raytheon claims that since the enhanced tactical capabilities of the new ruggedized, militarized smartphones (and iPod Touches) are software-based, new applications and capabilities can be easily added and removed to meet mission-specific requirements. The C4ISR piece alludes to potential for the Raytheon tactical smartphones to be integrated with the Joint Tactical Radio System network, potentially providing warfighters with “unprecedented access to intelligence in the field that would normally require multiple devices.” Basically, there’s no reason DefenseReview can see why an Apple iPhone or HTC/Google Nexus One can’t be used to control an armed/weaponized UAS/UAV Hellfire missile strike or a likewise armed/weaponized ground robot/UGV to kill the enemy remotely from the safety of your air-conditioned FOB. After all, an easy kill is still a kill. Bad guy’s just as dead. So what if you didn’t even have to break a sweat. Now, you can find him, target him, and kill him with your smart phone, and go have a snack. Let the robots do the work. I mean, why risk it? Right? It’s dangerous out there, man. Oh, and if the Apple iPhone 3GS and iPod Touch can be given the Raytheon/tactical treatment, it stands to reason that the same can be done to the new Apple iPad tablet computer, especially since C4ISR is reporting that “software developed for the Android operating system could also be expanded to other platforms such as tablet PCs, according to Keith Little, a Raytheon Intelligence and Information Systems spokesman.” After all, the iPad is really just a significantly larger version of the iPod Touch with expanded features and capabilities. It would seem that one of the keys to the whole thing is securing the network via secure cells and satellite uplinks (and downlinks) so you can’t be hacked/cracked. As long as you can secure the network, the only other defensive hurdle is camouflaging your radio broadcasting signature, so the enemy can’t locate and target you while you’re transmitting. Raytheon has apparently also developed streaming video camera feed, facial recognition, biometric collection, and license plate recognition software applications for intelligence gathering and analysis. Looks like the future may well entail smartphone-wielding soldiers liquidating insurgents with HellFire II missiles (fired from armed/weaponized Extended Range/Multi-Purpose (ER/MP) UAS airborne missile platforms), using only their thumbs, all while enjoying their favoriteFrappuccino, anywhere in the world. Raytheon has designed and will deploy new applications for power users of Apple handheld devices who conduct business on the front lines of the battlefield and in aviation safety. Raytheon, a defense technology innovator, is showcasing its role as a high-end software supplier and systems integrator to address a rise in demand for custom mobile applications running over secure networks to Apple’s® iPhone™ and iPod touch™ products. 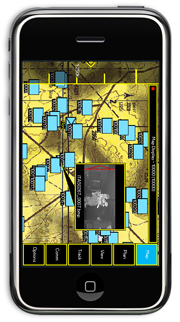 Training modules running on iPhone that allow air traffic controllers to practice aircraft vectoring and separation exercises on the small screen and at their convenience outside of traditional classroom training environments. Raytheon’s team on the FAA’s Air Traffic Control Optimum Training Solutions contract is using the solution as part of its strategy to transform air traffic control instructors from controllers to educators and to train them on how to reach the next generation. Raytheon’s approach has made it a magnet for a diverse range of military and non-military customers seeking to create and deploy innovative solutions using the latest portable devices. Raytheon will demonstrate the latest in mission software applications during the 2009 Intelligence Warfighting Summit Dec. 14-16 in Tucson, Ariz. Visit booth #220. DALLAS, Dec. 17, 2009 /PRNewswire/ — Raytheon Company (NYSE: RTN) has unveiled the first of a series of mission software applications specifically designed for Apple’s® iPhone™ and iPod touch™. Raytheon has developed intuitive situational awareness applications to leverage Apple’s rapidly growing mobile content and technologies, such as a compass, global positioning system, accelerometer, 3G networks, Wi-Fi and a multitouch screen. Raytheon has also designed other innovations for the device, including disruptive-tolerant networking, content-centric networking and augmented reality, incorporating security guards for tactical operations. With the market explosion of the iPhone and the more than 100,000 applications available, Raytheon has leveraged its innovations to provide U.S. military forces with the best technological advantages. The company has seen demand for the same innovations in mobile devices rise with its military and civil customers. Raytheon will work closely with Apple to deliver these and other powerful capabilities to customers in the coming months.